In part one, I showed that Florida, a 3 seed, was the best pick for your bracket even though they are not the best team in the tournament. The next step is to choose your other Final Four teams. Before moving on to the rest of the bracket, I added a few bullet points to the bottom of the previous post to help explain why Florida was the best choice. March Madness is set up so that most people feel like they have a chance (and therefore are talented) until the very end. 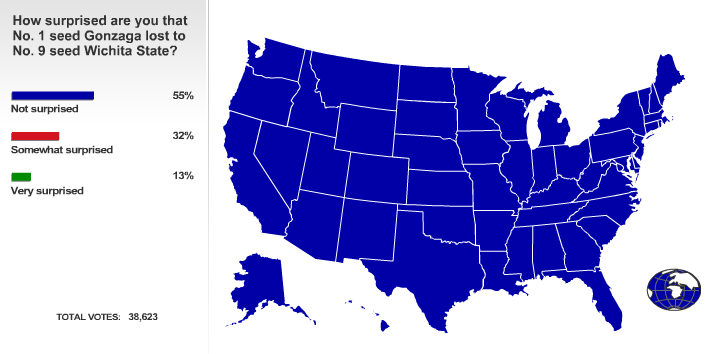 And then when their team loses…they say they saw it coming….87% had Gonzaga moving on. After choosing your undervalued winner, there are only 2 additional factors (beyond being over or undervalued) that you should consider before filling out the rest of your Final Four: pool size and expertise. Depending on these two factors, you should adjust your amount of risk. By risk, I mean upsets that are more likely to happen than the nation thinks (like Florida). For any round, you just compare betting lines, expert projections, etc. to the national averages (ESPN, Yahoo). I will break down pool sizes into 3 arbitrary categories for simplicity: small, medium, and large. This is your conventional pool with friends just for fun. Chances are that you would be the only one to pick Florida and your fate would be tied to them. But maybe you don’t need to take that risk. Since they’re all friends, the best strategy is simply to ask all of the people in the pool who they’re picking to win. People love talking about themselves and they won’t figure out that they are actually helping you win. In this way, you don’t even need to extrapolate from the national averages. If all 9 people choose a 1 seed and you are the 10th, choose the best alternative. It’s that simple. This strategy would probably lead you to Florida (or a 2 seed) this year. As for the rest of the bracket, 2 sub-outcomes could happen. Florida (or whatever your team is) wins, so you win. Or Florida loses. If a favorite (like Louisville) wins instead, you lose. If there is a surprise winner (which is not improbable as there is almost a 50% chance a 3 seed or greater wins), then it comes down to the rest of your bracket. You would probably win anyway if Florida lost in the finals or Final Four since most people had Florida lose by the third round. If Florida implodes right away, now you are at equal footing and still have the other 3 Final Four spots to win. In a small pool, it is not worth taking huge risks. Remember, a risky strategy (as long as they are good risks) leads to a higher upside but also more incorrect picks on average. So you’ll probably want to be pretty chalky (consisting of mostly favorites) beyond your champion pick. Hence, my final four was Florida, Louisville, Indiana, and Ohio State. A medium sized pool is usually an organization or a company. You still usually know most of the participants but can’t walk around finding who everyone else chose. 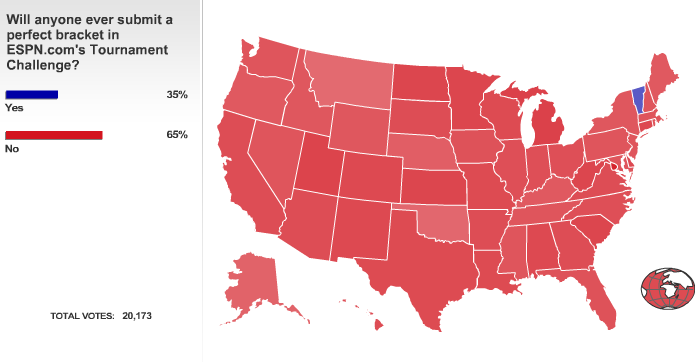 It is also probable that 1-2 other people picked Florida too. Now, you not only need Florida to win, but you also need to beat those couple other people. How do you beat those few people? This is a tough decision. You should just do the same chalky picks as in a small group, since you treat it as a new “Florida wins” group with 2-3 people. You no longer have to take risks to stand out from this small crowd. Everyone else who chose Florida probably took some more risks as well, while you should just choose the favorites as often as possible to maximize odds. Now, you can expect dozens of people to pick Florida as well. How do you differentiate yourself from them? Well, you choose another highly undervalued pick as your other finalist and put all your eggs in a Michigan State (for example, another 3 seed)-Florida final basket. It is the only way to differentiate yourself while improving your odds. As the pool size increases, keep taking risks from the top down. You should choose undervalued picks for the other Final Four spots too. Maybe Wisconsin and Butler? You get the picture. Strategy: Perfectly predict the final with neither team being a 1 or 2 seed. Pick other lower seeded Final Four teams as the pool size increases. Choosing a Louisville-Indiana final is not very smart. There is a high likelihood that you can perfectly predict the final and still lose the league. As the rest of your league gets more knowledgeable (for instance, the Princeton Sports Analytics group), you have to take more risks just as you would for a larger group. Notice how all of this requires no knowledge of basketball. You might think this ruins the excitement of choosing your own picks. This is completely not the case. You can still choose which upsets (as long as they are good risks) and can brag when you predicted the 3 or 4 seed of your choice to make it to the Final Four. The next post will deal with how to choose the first couple rounds (the next step) and the probability of a perfect bracket.